Happy October, friends! I am currently sitting here indulging in all of the fall treats as a coping mechanism for being 40 weeks + 1 day pregnant, with no baby to show for it just yet. HOWEVER, I do have to say that I’m so excited for this little nugget that she gets to have an October birthday – I think this month is so magical; it’s like you flip a switch and suddenly there is so much joy to be found in pumpkin patches and turning leaves and apple-flavored anything… it’s so fun. There have been so many instances in my life over the past few years where the planner in me truly feels like I can see the road that God is leading me down. For instance, during this move there was so much that was “known” about what we were doing: we were moving back to our hometown that we “knew,” into the childhood home that Jordan grew up in that we “knew” so well; I was returning to my company’s Charlotte office that I “knew;” we were returning to a host of family and friends that still lived in the area and “knew” us, and so on. But from the moment we pulled the UHaul into our driveway, we have been taken aback by just how much unknown really sat before us. From moving and home renovation timelines being pushed back to Jordan adjusting to his new job and everything in between, it took less than 24 hours for me to tearfully admit to Jordan, I think we just bit off more than we can chew. I will spare you what could very easily be thousands of words on the nitty-gritty details of the random challenges that have come about during this move and life transition, but I will say that these past six weeks have been challenging, sanctifying, heartbreaking, and truly refining in every way. If I had it my way, I definitely wouldn’t have jumped into this madness (had I even known what it would be) at 34 weeks pregnant, but it has just been one more way that the Lord has revealed to me how much more His power is made perfect in our weakness. And wow, has the Lord really broken down mine and Jordan’s self-sufficient mentality that we took so much pride in – if it weren’t for our family pouring hours upon hours into helping us move, hosting us at their house, feeding us countless meals, and dealing with our anxiety-filled reactions to even the smallest problems, I don’t know where we’d be right now. Having them by our side for weeks on end as we have tried to get our lives together here has filled me with both immense gratefulness and a sense of shame as I’ve looked back on all of the times I like to proclaim that I’m SO strong and capable of taking things on solo. Praise the Lord that He’s started to break that in me within the context of so much grace and love – I most certainly don’t deserve it. Yesterday afternoon, we finished off the weekend feeling like we had FINALLY gotten our house in a place where the rest of our to-do’s could hold for a bit (something that I naively believed was going to happen about a week after we moved home). And now, we’re about to take on a whole new adventure with our little one literally making her entrance into the world at ANY time – it’s scary and exciting and SO unknown that I can’t even wrap my head around all that is to come. Several years ago, I wrote a post on this blog (probably one of my all-time favorite posts) about all of the things I would have missed about God’s grace and provision if I had known what was to come. As I sit here and reflect on these past few weeks, that same sentiment could not be more true. 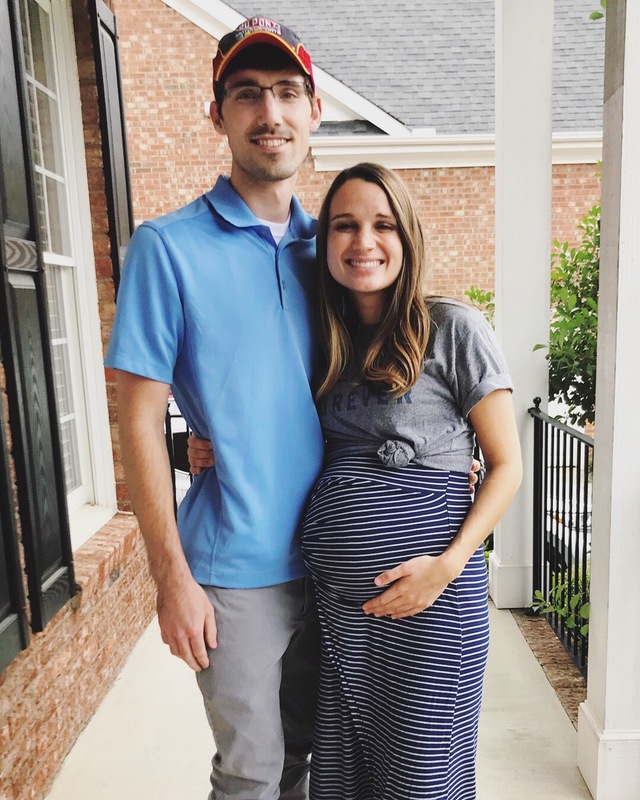 I almost started off this post by throwing in a general word of advice not to make a major life change at 34 weeks pregnant. And, oh – don’t expect to renovate your house and have it at a Fixer-Upper level of perfection in just a few weeks. And don’t count your chickens before they hatch or bite off more than you can chew, or any other cliche that would encourage you to just hide in the shadows. But the truth of the matter is that it’s in our big steps of faith (or, honestly, even in just the big steps alone where God then sustains us through faithfulness), our messy moments, and tearful realizations that we learn so much about God’s unending provision in our lives. He has been so good to us in the midst of the madness, and I truly can’t wait to see just how much of His goodness we will experience up-close and on a whole new level as we start a new chapter of life raising our daughter. …and next time you hear from me on here, we will be a family of THREE! Watch out, world – things are about to get crazy. « virginia is for lovers.